A grid of tiny holes patterns this 1770s woman’s ensemble of sack, petticoat and stomacher. The practice of making deliberate decorative cuts in fabric was known as ‘pinking’ and it was revived in the mid-18th century. The fabric would be folded several times and cushioned with paper, then placed on a block of lead. Striking a metal punch with a hammer created a pattern of regular cuts or ‘pinks’. Punches with a curved and serrated edge made the decorative edge of the ruffles, an effect similar to that produced by modern pinking shears. Pinking is found on the robings and sleeve ruffles of the sack, and the trimmings of the petticoat. Although it was time-consuming and required considerable skill, pinking could be executed more quickly than other decorative techniques, such as embroidery. In the mid-18th century, the curvilinear edges and surface patterning produced by pinking harmonised with the aesthetics of Rococo design. 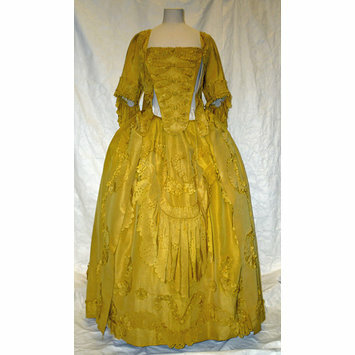 A woman's sack, petticoat and stomacher of yellow ribbed silk. The sack is open at the front, with robings to the waist and elbow-length sleeves with double, scalloped and pinked sleeve ruffles. The bodice and sleeves are lined with linen. The back has double, box pleats stitched at the neckline. The sack is made of 6 widths of silk; there is a waist seam from front edge to side seam. The front skirts are pleated at the side seam with the pocket openings. The skirt fronts are decorated with a ruching of silk with large star-shaped pinks, and scalloped and pinked edges. These are arranged in serpentine curves down the front opening, along the hem and back up the front over a side seam. Narrower robings in the same style edge the robings and neckline. A silk-covered button at the lower end of the pocket opening on the inside corresponds to a yellow silk cord loop below it, allowing the gown to be looped in imitation of 'retroussé dans les poches'. The petticoat is made of 6 widths of silk, with a box pleat at centre front and flat pleats at the side and back. The waist is bound with yellow linen tape, which forms the fastenings at the centre back. There are pocket openings on each side. 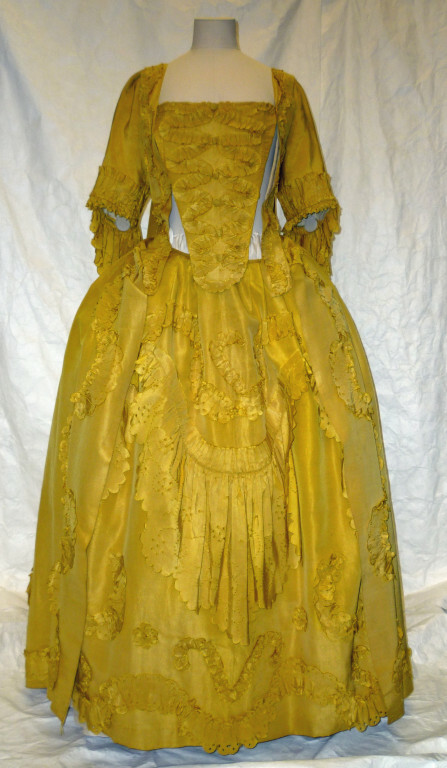 The petticoat is lined with yellow glazed wool. A ruching of pinked silk arranged in reversing curves, runs above the hem all the way around the petticoat. Above it is a deep flounce of scalloped and pinked silk arranged in curves. Narrower bands of ruching and rosettes of pinked silk adorn the front. At some point, the petticoat was lengthened at the waist; the linen tape binding is 18th century. The stomacher appears to have been reconfigured later in the 1770s. The trimmings are not scalloped and pinked in the same way as the gown and petticoat. Two bands of pinked silk are arranged in serpentine curves parallel to each other. Six silk-covered buttons are sewn to the centre of the stomacher. It is unlined and bears stitch-marks from other decoration. The sack was altered for fancy dress in the late 19th century. A large tucks was stitched in each bodice front. Hooks and eyes were added to the stomacher and bodice fronts, and lead weights to the bottom end of the robings.